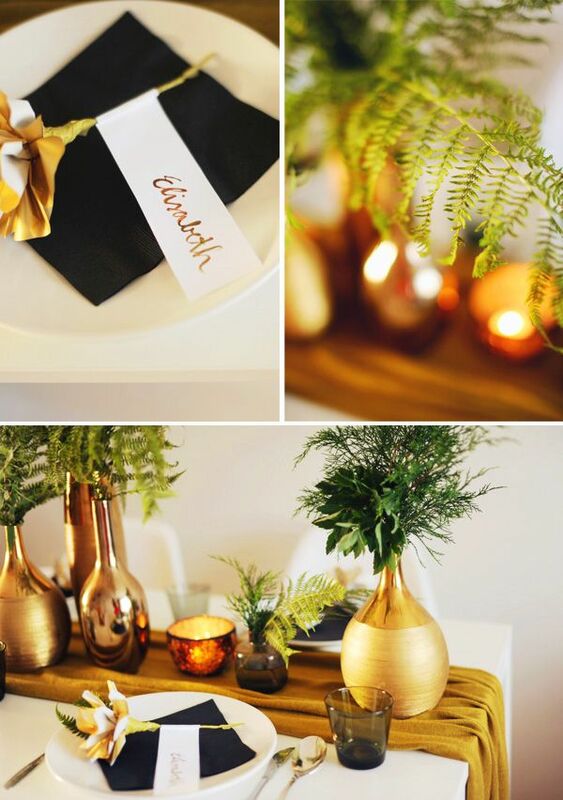 For a while now I've been wanting to create a small inspiration shoot using gold as the main colour. So, I went and bought some lovely golden spray paint. 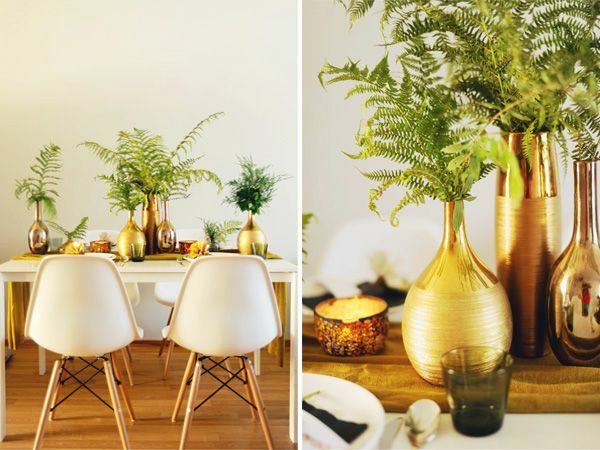 Then, in search of some inexpensive vases that I could spray paint golden, I made my way to a local home & convenience store and stumbled right into this last-chance-sales table filled with these golden vases. So, I cheated, saved myself the work of spraying them golden and got these plus the mosaic votives for less than 10€ altogether. Grand! 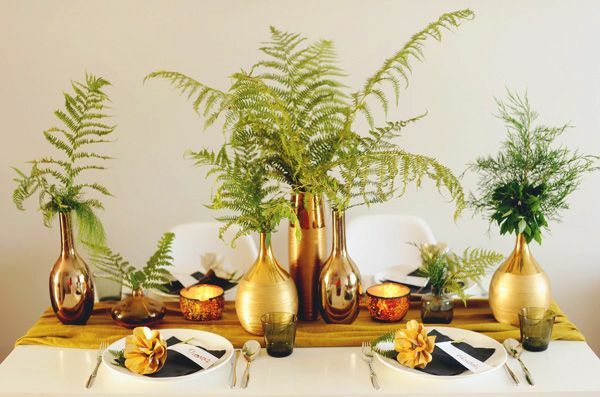 If you're not as lucky as I was, you can whip up the same type of table setting using any selection of vases or vessels and spray paint them golden. The other materials came at very low costs, too. All plants are picked from a forest nearby (I love ferns!) and the table runner is a scarf I had lying around. For the place settings, you can make some easy paper flowers using Martha Stewart's tutorial. 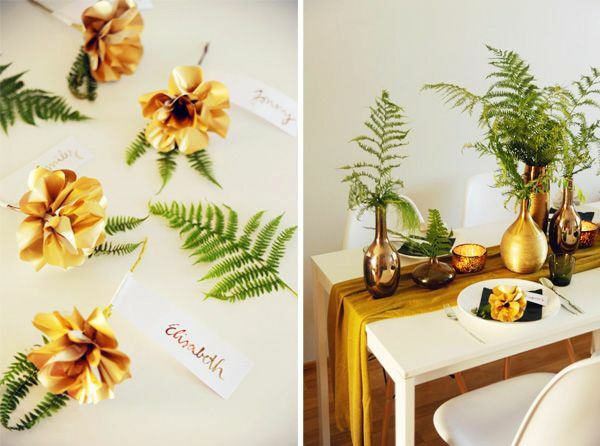 In the end, just attach a bit of fern to the stem with masking or flower tape. The name tags are handwritten with water colors in the scheme of the table setting. All this comes to about 15€/table and with a little practice in paper flower crafting, it's super-quick, too. 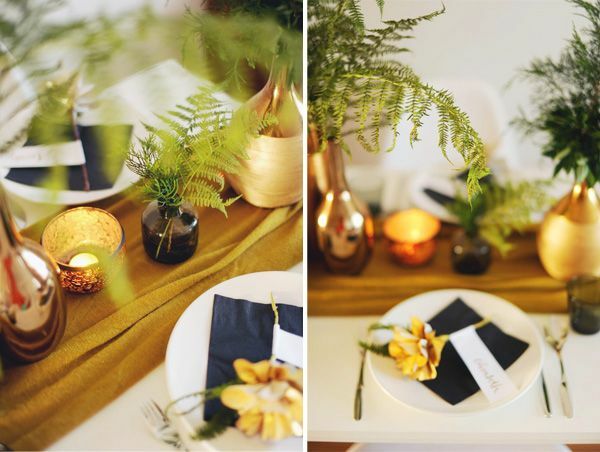 I spent about 3 hours on picking the greens, crafting the flowers and tags, setting the table AND taking the photos. So, even for an event with more than 20 tables it's not a huge project. And really not an expensive one either. Love how the black makes the gold and green pop. Great colour combo! Wow this is awesome. Very royal. Totally reminds me of the royal wedding. Love how it turn out!! Such a great way to save some money while planning a wedding... and most importantly... a great way to create a beautiful wedding decor!! What a fantastic job! 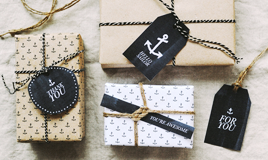 I absolutely love this....and want to do something similar now for fall//Christmas!